Share any photograph and explain why you did. This is the photograph I’m thinking about right now. Cory needs to turn his senior picture in for the yearbook by Friday. I’ve been telling him all summer that we need to get out and take some pictures (photographs?) so we can get an idea of what he likes and hopefully come up with something good. But he never wanted to do it until last Friday. This is the one he likes – except it needs a little work. We went back to the library last night to see if we could get a few more, but he’s not happy with any of them. Thanks to my brother, the photographer, for his tips, but it just wasn’t happening. This is the one. I’m just going to do a little editing. The size it prints in the yearbook, it will be fine. Is there any way to get everything done in a day that needs done? I probably shouldn't be complaining or even asking because I'm home all day; I should be able to get things done. Then I keep thinking about how the kids are all but grown up and will be out on their own soon. Then what? My husband seems to think I should go back to work, but I have no idea what I would want to do. It's not like I have some great career I want to go back to. I suppose I could go back to school like some of my friends are doing, but first I think I need to figure out what I want to be when I grow up. And both going to work and going back to school mean time away from home, and I keep wondering who's going to do my work. You know all the stuff that isn't getting done now? Even less will be getting done then. I know other people do it. Somehow. One solution might be to look into Online master degrees from Gonzaga University. Of course, I'd have to get a regular degree first, and I'd still have to decide what I want to be when I grow up, but the idea of getting an online degree really appeals to me. It sounds like it's something that could fit into an already busy schedule. What I'm reading is that many of the top ranked programs are reluctant to go online because they feel that it diminishes the quality of the education. Gonzaga feels the opposite and believes that offering online programs gives busy professionals the opportunity to further their educations where they otherwise might not have been able to. The quality of the education must be pretty good, too because Gonzaga has been ranked one of the nation's best universities by The Princeton Review and Forbes Magazine. Now, what should I be when I grow up? No sense in going back to school until I figure that out. Tillie has competition. She will no longer get to be my Camera Critter choice practically every week. Now we have another adorable little critter living in our house. His name is Weasley. He’s only been here since Monday, but he’s already making himself at home. He’s not afraid to check everything out, and I think he’s decided that he’s going to like it here. Tillie still isn’t too sure about him, but he desperately wants to be friends. Yesterday they were both on Beth’s bed, and Tillie let him get close. Weasley just purred and purred at being so close to her. Eventually Tillie had had enough, hissed at him, and he moved away. He’s a persistent little guy, so I don’t think he’s giving up! Everyone else in the house already seems to love him, so why not the big white kitty? We went to Sears tonight so Jeffrey could spend his $50 card. He got a couple pairs of dress pants, and Cory got a couple dress shirts - with the card only about $8. So that was a pretty good deal. Then we went down to the juniors department to see if I could find something to use my $10 coupon on. They really didn't have a lot that I was interested in, but I went through the clearance, tried on some pants, jeans, and shorts, and found that all the sizes seem to run really small. So I had to find some larger sizes and try those on and finally found a top, a pair of shorts, and a swimsuit bottom. I gave the top to Jeffrey to buy. It was $15 so would only cost $5 with the coupon. I was going to buy the swimsuit bottom and shorts - $7.99 and $3.99, $2 after coupon. BUT, when we got to the register, and Jeffrey tried to buy the top, the cashier told him that they were no longer accepting the coupon and pointed to a sign on the register that said they weren't accepting them and apologizing for the inconvenience. So we just tossed our stuff on the register and walked out. Talk about a waste of time! If they'd posted that sign in the department, I could have saved myself a lot of time and trouble trying stuff on - because it wasn't like I really needed anything, but I was willing to look since they gave me the coupons. It really wasn't worth the trouble after all. When we got home and told Beth what happened, she said we should have asked to talk to the manager and made them honor the coupon. Remember, she works in retail and sees this kind of stuff all the time. I guess I just don't think like a real customer? Still, the coupon is supposed to be valid from 9/15 - 11/14, which means it's only been less than 10 days and already they're not honoring it? Not cool. The weird thing is that when I got home, I checked Juniors apparel at Sears.com, found a pair of jeans I liked, and entered the coupon there. Guess what? $10 off my order. How come I can use the coupon at Sears.com but not in the store? Is it just my local Sears? Has anyone else had this problem? So I saved $7 or so that I was going to spend on stuff that I didn't really need - but the top was cute - I'm still quite frustrated. I just added a widget that shows the items I've shared in Google Reader. I've been thinking about adding one for a while, but then forget about it or can't find the page to get the code. The only problem is, now that it's on my sidebar, I realize that I haven't shared anything for a while, I guess because there wasn't much point in sharing if no one was seeing it. Now that I've got the widget, I'll have to be sure to share all the interesting and helpful posts I read. They might just be something you're interested in, like Myrtle beach hotel deals, awesome giveaways, yummy-sounding recipes, or funny stories, so keep an eye on the widget in the sidebar to see what's catching my eye. Cory will be playing Captain Hook in the school musical Peter Pan this year. He expected to get the role, but he still had to try out. Last Friday he told me that he is officially the bad guy. They've had one cast meeting and officially start practice this week. It sounds like there are quite a few people involved this year, and I look forward to seeing how it all comes together. Cory says he needs to practice sword fighting with his left hand because the hook is supposed to be on his right, but this picture shows the hook on the left. Does anybody know which is right (or left)? I've never seen this musical before and never paid attention in the movies either. I never actually saw any musicals until Jeffrey started running sound and Cory started getting involved in the school musicals. I thought I saw Pirates of Penzance when I was in college, but I only recently found out that it was only excerpts from the musical for some reason. But I didn't know the difference back then, and I enjoyed it anyway. The musicals and plays are a lot of fun, and I'm always amazed at what they can pull together with so little and in such a short time. I'm sure this one will be no different. I accomplished a lot today - folding towels, washing dishes, snuggling a little kitty, all kinds of important things. I entered a couple giveaways, searched some web directories, picked tomatoes from the garden, and made zucchini bread. There are a couple more zucchini out in the garden that will need picked before too long. The tomatoes taste good, but they're all cracked, and I have to cut a lot off of them because they get bad around the cracks. There was quite a bit of the kitty snuggling going on. Weasley is still kind of skittish, but he's settling in well. He's getting used to us and loves to be petted, as long as we don't move too fast. I'll sit down next to him, and he'll just flop down on his side and purr and purr. Then he'll get up, walk around and rub on me and finally climb into my lap and settle down. I can't exactly get up and go do anything when he does that, can I? I figure if we give him lots of love and attention he'll settle right in and maybe even decide to be a snuggly lap kitty. Tillie's been pretty loving today, too - maybe trying to be sure we don't forget her. She was also less timid toward him, following him around while watching his every move and growling at him. The growling and hissing doesn't seem to bother Weasley since he was the runt of the litter and all the other kitties used to growl at him. He's used to it, and he's determined to be her friend anyway. Cory got a new kitty. He's been begging for one for ages, and I finally broke down and said yes. So now we have this little orange guy named Weasley. Our friends Don & Peggy (of audiorescuers fame) picked him up at his old house and brought him here yesterday. Weasley was not a happy guy. First he was put in a cage and then stuffed into a pillow case - with some squirming, scratching, and escaping thrown in for good measure. By the time he got here, he was thoroughly traumatized. So we gave him a place to sleep, a litter box, some food and water, some cattle supplies. OK, you got me, no cattle supplies, but all the rest, and then we shut him in a mostly dark bathroom - and just left him alone for a while. Since then we've been letting him out to explore and adjust to his new surroundings. He's a curious little guy who loves to explore and play. He would like to be friends with Tillie, but she's having none of that. She just watches his every move and growls. Hopefully she'll decide he's not too bad before too long - once she figures out that he's not going anywhere. I need to get back into the swing of things. I can't figure out how times goes so fast. I only posted here three times last week, and all my other blogs were completely ignored. Not only have I not been posting anything, I haven't been visiting anyone else, either - except randomly. It's not that I don't have things I want to say and posts I want to make. I have several reviews to do, a giveaway I said I'd do, and some assignments that need done. I think I'm getting to them, but next thing I know, several weeks have passed, and I still haven't done them. And it seems the longer I go without getting things done, the harder it is to get them done at all - kind of like when you stop using the exercise equipment in your basement. The longer you go without using it, the harder it is to start up again, and before you know it you can't find the exercise equipment for all the stuff piled on top of it. So, how do I blow the dust off the keyboard and get back to it? Any suggestions? I can’t believe I missed Looking at the Sky last Friday. It wasn’t that I hadn’t been looking at the sky and taking pictures, it was just that I got busy trying to get this whole list of things done, and before I knew it Friday was over. I did have some Cinnamon Rolls, Whole Wheat Sourdough Bread, and Chocolate Coconut Bars to show for my Friday. Friday is slipping away from me today, too – I made the bread again, and some Banana Muffins, and I went to school for a while to help get band members fitted with band uniforms. That sky is so blue someone must have taken some air filters to it, don't you think? This week I’ve been watching the moon every morning, watching it get thinner and thinner, until this morning it wasn’t visible at all. Sunday night we should be able to see it again – right after sunset. I really love the phases of the moon and seeing how it changes throughout the month. Around Fathers' Day I mentioned the Sears spend $50 get $50 deal. You had to spend $50 or more on any combination of men's pants or jeans, and Sears would give you $50 to spend on men's apparel. Well, we got the $50 Sears card last week so Jeffrey has until the end of October to buy new clothes at Sears. Even better? I can get me a little something, too because I just printed this coupon for $10 off Juniors' apparel at Sears. It's good now through November 14th, and there's no minimum purchase. I wonder what Sears has on clearance? When they discontinued their rebate program earlier this year, Walgreens said they had something just as good if not better planned. I don't know if we're still waiting or if this current Register Rewards program is it. I hope they've got something better planned because this whole register rewards thing is not so good. Sure, it sounds good when they advertise something at a sale price, tell you they'll give you so much in RR, making the final price look really good, sometimes even FREE. However, in real life it doesn't work so well. Actually getting a good deal means you have to find the item in stock or be willing to go back several times during the week. If the item is out of stock, you can still get a raincheck, but that only applies to the sale price. Unless you buy it the week that it's advertised, you won't get the register rewards - kind of negating the whole thing. When you do find the items in stock and actually get the rewards, you only have 2 weeks to use them. Sometimes I don't shop that often, and I hate having that short window to use the 'cash' I've earned. Except that it's not really like cash. These register rewards are actually manufacturer's coupons. That means, that if you already have coupons for something you buy, you can't use these, too - because you an only have 1 manufacturer's coupon per item. I found that out a couple weeks ago when I separated my items thinking that I could use the RR I earned on the first order to pay for the second one. Nope, didn't work that way. So I walked out of the store with $9 in rewards. We were out yesterday so stopped at Walgreens to see if we could spend the $9 - since they expire on Wednesday. I figured that if I didn't actually need anything, I could buy something else that gave me register rewards, thereby extending the expiration date by a couple weeks. But the 'FREE' items that were advertised were out of stock. So I grabbed a couple boxes of hair color - $1.99 each with the coupon in the ad - and tried to use two of my $2 RR certificates, only to find out that I could only use one unless I bought something else. ??? Just frustrating. I ended up grabbing some mints that were marked down to 25¢ so the whole thing would work. And it was good that I found the mints because Cory wanted some and went back in to grab himself some, but overall I am not impressed with this Walgreens Register Rewards program. I liked the rebates, especially after they set it up so that you could enter your receipts and submit your rebates online. All rebates should work that way! I liked putting my rebate dollars on my Walgreens gift card - so I still spent the money I got back at Walgreens, I just didn't have to spend it within a couple weeks. I took Tillie out the other morning, and she had fun exploring. I was surprised she actually went out into the grass. Usually she tries to avoid it. This time was especially surprising because the grass was still wet from the dew. It couldn't be easier, tweet to be entered into the Netfirms contest. You can tweet once per day to enter. Another way to enter is to register a domain via twitter. Didn't know you could register a domain through twitter? Neither did I, but with Netfirms now you can. So, when you're surfing the web or out on the town, and you suddenly think of the perfect domain name, you can register it right then and there. Simply send a DM to @Netfirms with the following: reg mynewdomain.com (replace mynewdomain.com with the domain you wish to register. If that domain is available, they'll send you a confirmation of the registration, for the low price of $7.95. And for every domain you register, you get an entry into the contest. The Netfirms contest ends October 7, and you can tweet once per day. What Next, a Log Cabin? If you've been reading my blog at all this summer, I'm sure you've seen the big project for the summer - Jeffrey and Cory built a deck and pergola. I keep mentioning it because I absolutely love it. We have been using it as often as possible, grilling out, eating dinner out there, enjoying our coffee in the mornings. There are times I catch myself wondering, 'why didn't we do this sooner?' Cory has asked the same thing a few times. The truth is that there were other things that needed done first - a shed built in the back yard, the basement finished so it can be usable (see previous post), stone walls put up for flower beds around the house. The shed and the basement Jeffrey basically did himself. He tried to get Cory to help him, but Cory wasn't really interested. Cory did help with the stones around the house, and this summer, with the deck, he helped a lot. He enjoyed it, too! So, yes, there were priorities, other projects that needed done, and we didn't want to go into debt just so we could have everything at once, but the main reason we didn't do this sooner was that Cory wasn't ready for a project like that - or at least he didn't think he was. 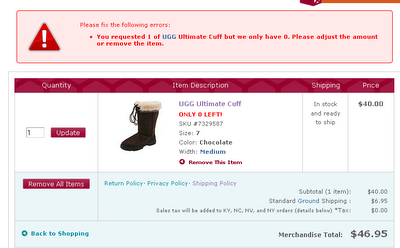 Last week I mentioned a certain website that was putting all UGGs on sale for 80% off. Now, the last few pairs of boots I've had cost $20 or less. Yes, I love Goodwill and clearance! But, the idea of saving 80% got me to looking at some of these boots, and I found some I really liked. Real suede, sheepskin, fleece, cushiony soles - they sounded really nice. So, this morning I attempted to buy some - only to be completely frustrated. I put the boots I wanted into my 'shopping bag' then went to see if I could grab the pair Beth wanted, too. Hers weren't available any more, so I decided to go ahead and buy mine. By the time I registered with the site - as far as putting in my name and email and selecting a password - I got a message telling me that I requested 1 pair of the boots but they only had 0, please adjust the amount or remove the item. Huh? My boots were just snagged out of my cart! Did someone else get them? I tried several more times, and just got messages that the item was not available or out of stock or else the server timed out. I guess everyone else was interested in saving 80% too. There was a panther hanging out with the cheerleaders! We went to the first high school football game of the year last Friday night. Usually the band plays, but since school hadn’t started yet, they didn’t. We went anyway since I bought the passes at registration, and it’s a pretty enjoyable way to spend an evening. Cory, the only one who actually attends school there, stayed home. Our team did pretty well. Sometimes the other teams are a lot bigger and better, and we all wish they’d take weight loss supplements, stop lifting weights, and skip practice for a month or two so our team would have a chance. This time, though, our team was ahead 13-0 with 5 minutes to go in the 4th quarter. And then the ref paused the game because of lightning – and according to state law, once the ref mentions lightning, the game cannot resume for at least 30 minutes – from the last lightning strike. It was still a ways off, and probably wouldn’t have even gotten to us until the game was over, but it was too late. We decided not to wait around to see if the game would resume and just came on home, so I don’t know if they ever finished the game. It was still a lot of fun, and I took some pictures of the sky, too – of course. The moon was still visible, hadn’t even been covered by clouds by the time we left. By the time we got home, the moon was gone, and it wasn’t long before we got some good rain – and sitting at home, inside where it’s dry, was much better than sitting out at a football game. Definitely. It's always amazing to see the things kids can come up with to get themselves into trouble. I watched a couple videos on YouTube this morning that feature one little guy who just doesn't learn. There was one called Kids aren't that smart - Bars. And this other one about the boy and his cat. The cat one really reminded me of when Beth was little and how she always wanted to 'love' the cat, even though he told her quite clearly that he wanted to be left alone, until finally he had to resort to biting her. Of course the videos got me to wondering where this little guy's parents were - because he really could have used some supervision. Kids aren't always smart enough to know what's best, that's why they need two parents to take care of them! Unfortunately, unless you remember how to think like a kid, it's sometimes hard to imagine what they might do until they actually do it. At least it was for me. What are some of the things your kids did that left you shaking your head and wondering why it ever entered their little heads to do that? I hadn't heard of this website - 6pm.com - until recently. It's a one-stop, online source for brand name shoes, apparel and accessories for women, men & kids - all at up to 75% off retail prices. Great deals for anyone who wants the brand name but doesn't want to pay the price. I have never really paid that much attention to brands and designers, and I honestly can't see how a pair of shoes or a purse can be 'worth' over $1000 - yes, there are some MSRPs listed here that are over $1000, but taking up to 75% off of it brings it down a little closer to a reasonable price. (even 90% off $1000 wouldn't be in my price range unless I absolutely fell in LOVE with a pair) I'm am seeing some very cute shoes here that fall into my price range, though. 80% off MSRP all Uggs! Shipping is just $6.95 no matter how much you order. Will you be shopping? I always used to take pictures of the kids on their first day of school. Middle School started and that tradition somehow got lost in the shuffle of rushing out the door to catch the bus. But since yesterday was Cory's first day of his last year of high school, I thought it would be a good idea to get a picture or two, and then compare to his first day of kindergarten. All grown up! Where did the time go? He's still the same sweet, huggable guy - just taller, and his toys have changed a little bit, from Hot Wheels, blocks, and Beanie Babies, to computers, cameras, and video games. He's turned into quite a handsome young man!